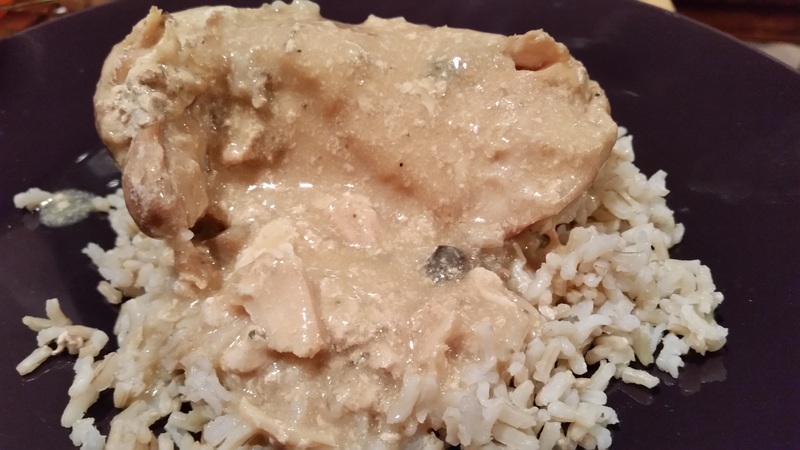 Slow Cooker Chicken with Mushroom Gravy – What's for Dinner Moms? So, the picture is a bit strange on this dish but my kids both liked it. I needed a quick dish to drop in the slow cooker so that we could eat in shifts and I could be out the door quickly. I had a bag of chicken breasts and after a quick search through the pantry I found 2 cans of cream of mushroom soup. I hardly ever use canned soup but desperate times called for desperate measures. A can of mushrooms later and dinner was in the slow cooker! I had my son make brown instant rice to go with his dinner and he liked it. He thought it had a lot of flavor and the chicken was well cooked. I didn’t get to have any because by the time I got home at 10 pm everything was cleaned up. Both kids thought it would have been better if I actually made them mushroom gravy from scratch but I definitely did not have time for that! I had the kids make a hearty spinach salad to go with the meal. In bowl of large slow cooker place chicken breasts. Pour beef stock, mushroom soup, Worcester sauce, and mushrooms into slow cooker. Mix well. Cover and heat on low for 6 hours. Remove cover from slow cooker 20 minutes before serving and add sour cream and black pepper. Stir into sauce and taste. Adjust spices as necessary. Serve over rice or pasta as desired. Great! This was a first attempt. I didn’t even get to try it!